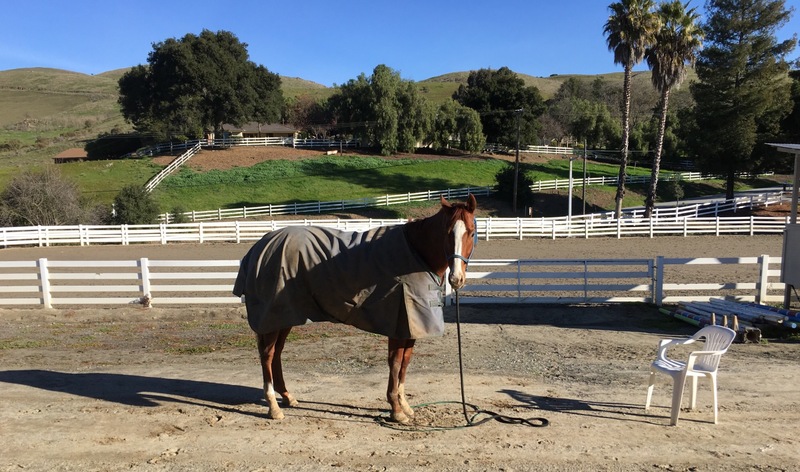 With all the horses I train, I like to spend a lot of time solidifying the basics. It is much easier to progress smoothly through the levels if the basics are firmly in place. Good basics are very boring, many people don’t spend much time on them because they require the patience of a fisherman on quaaludes. Patience is a necessity for every good horse trainer. It’s also a necessity for any good riding horse. Horses are like people in that some are more naturally patient than others. Just like people can work on their patience, horses can also be trained to be more patient too. One of my cowboy type teachers told me that his horse needed to stand still well enough for him to smoke an entire cigarette without touching the reins. Yuck, I don’t want to have to smoke cigarettes to train my horse, this is the 21st century! Instead, I train my horses to do something much more modern. They have to stand still long enough for me to write an email on my phone. Blue and Corny both need to work on their patience. I start this training by getting them to stand in one spot at a distance from me. Usually I imagine a circle the size of a hula hoop for the horse’s front feet. For the purposes of these pictures, I used a spiraled cord to represent the area in which I want the horse to keep his feet. 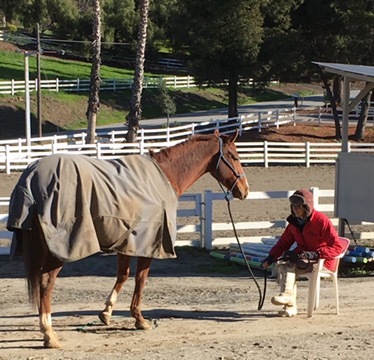 If the horse moves out of the circle, I stay where I am and put his feet back into the circle. Corny relaxed and focused on me. 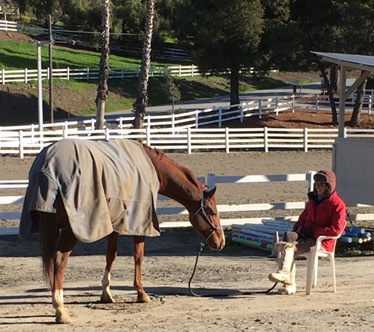 While sitting in a chair is not generally something that is considered safe to do around horses, I’ve mitigated some of the risk by making sure there are plenty of ways for the horse to go other than over the top of me. This is a great exercise to do when waiting for something. 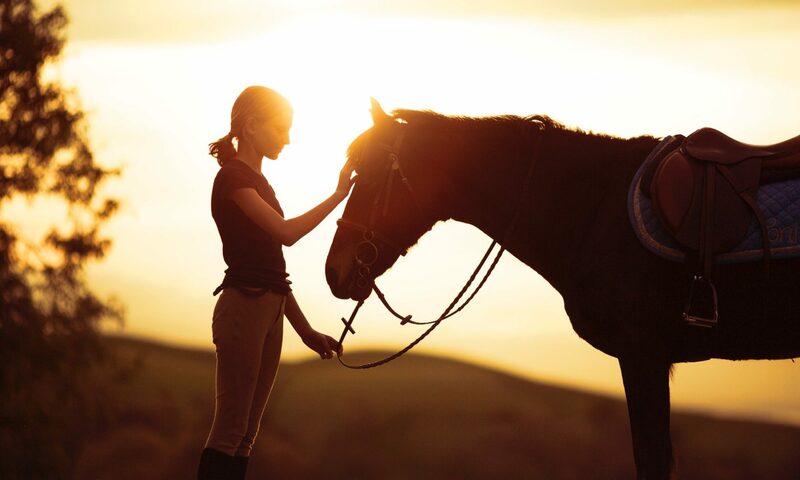 It helps there horse gain confidence and respect standing at a distance from his handler. The handler will get good practice making finely tuned cues to get the horse to go back in his circle. I’m asking Corny to step back into the circle, without getting up. Blue and Corny did very well at this exercise! After a bit, I decided to work on ground trying and walked away. In general, Corny wants to follow me around everywhere and Blue is always looking for an opportunity to walk away. Even though I intended for the coil on the ground to be a representation of an imagined area for the sake of photos, I think it helped the horses know they were supposed to stay put! Perhaps the coil is there loosest set of hobbles ever. It was hard for Corny not to follow me, but he ground tied like a champ. After the parking brake has been installed on the ground, we move on to mounted installation. The principle is the same, imagine a hula hoop size area and keep the horses front feet in it. If the horse steps out of place, move them back in as few steps as possible. For example, if the horse walked forward out of place, back them into three circle. If the horse sidestepped left out of the circle, side step him left to get back in the circle. Blue doing well with his parking brake installation. He has nice relaxed ears and a low neck that tell me that he’s not about to walk off, even if I move around in my tack. This training will come in handy when trying to have a conversation while mounted, adjusting stirrups, or tightening the girth. For competitive purposes, it will help the horse be immobile in their halts, and wait politely for their turn to show. 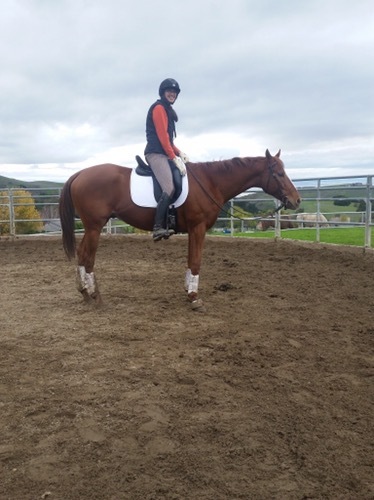 In a more big picture approach, it will help them to wait for their rider’s cues. Previous PostPrevious We’re speaking the same language, right? Next PostNext It’s an arena, not a racetrack!